This 10″ cake features handmade, 3D penguins polar bear & snowman made out of rolled chocolate. The cake is finished in OMBRE light coral buttercream rosetts and finished with snowflake design work. This design requires a minimum of 3 weeks notice to begin inquiry process. 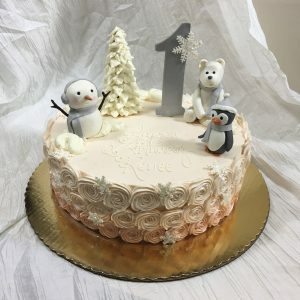 Please complete custom cake request for pricing.